The Big Bang Theory: Season 8 DVD The three-disc box-set includes all twenty-four episodes of The Big Bang Theory's latest season. The bonus features include a gag reel, footage from The Big Bang Theory's 2014 panel at Comic-Con, and four behind the scenes featurettes: "Shooting Stars: BBT on BBT" about Billy Bob Thornton's guest appearance, "Constellation Prize", "Here's To You, Carol Ann Susi", and "It's A Quark ... It's An Atom ... It's the #BBTSuperfans". The Big Bang Theory: Season 8 Blu-ray The two-disc Blu-ray box-set includes all twenty-four episodes of The Big Bang Theory's 2014/15 season on high-definition Blu-ray. The episodes are presented in 1080p widescreen with DTS-HD Master Audio 5.1. The box-set has the same special features as the DVD and also includes Ultra-Violet digital downloads of the episodes. 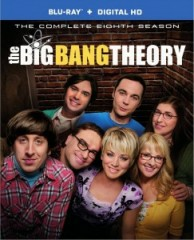 In the United Kingdom and Ireland, The Big Bang Theory: Season 8 DVD and Blu-ray box-sets were released on Monday. TBBT Seasons 1-8 box-sets were also on released on DVD and Blu-ray. For fans in Australia and New Zealand, the Season 8 DVD and Blu-ray are released tomorrow, Wednesday, September 16.